NEW DELHI/MUMBAI, July 23/24, 2012 — Asia Society India Centre hosted the India premiere of the Academy Award-winning documentary short Saving Face, followed by a conversation between Sharmeen Obaid-Chinoy, the film's co-director and first Pakistani to win an Oscar, and filmmakers Ashvin Kumar and Kiran Rao in New Delhi and Mumbai respectively. Following the screenings, Obaid-Chinoy candidly revealed her thoughts and experiences while filming such an important and potentially risky documentary.When asked how she was able to cope filming and interacting with the victims and perpetrators of acid violence, Obaid-Chinoy spoke about her attempt to understand the differences between herself and her film's subjects. She began by crediting her father, “who told me 'If you speak the truth, I will stand by you and so will the world'… I consider myself an emancipated, liberated and educated woman… I feel sorry for these people because the system [within Pakistan] has let them down and they are not aware of their rights and they are not aware that what they are doing is wrong." 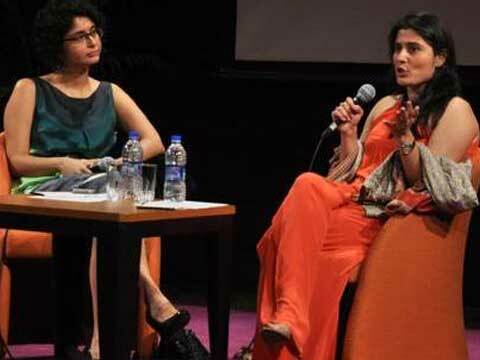 The filmmaker also spoke about how she dealt with the polarization of lives within Pakistan. "I couldn't come to terms with the fact that Pakistan had created women like myself and women like those in the film… I would wonder how could this be such a schizophrenic society?" In revealing the film's characters, Obaid-Chinoy further discussed the human condition and the basic needs she thinks remain the same throughout the world: "I've found that human needs and wants are exactly the same, and you need to find a common ground with them and get them to start looking at you as not the 'other', but just like them." Obaid-Chinoy also cited the relationship between two of her film's characters, Zakia and her daughter, admitting "I asked myself whether I would be as strong as Zakia. Would I be able to go on through life, fight a case in the justice system that we have in Pakistan, and live life surgery to surgery?" Answering questions about why acid violence arises, Obaid-Chinoy again eluded to the human condition within failed systems. "Acid violence transcends national boundaries. It's a phenomenon that happens when you put a certain set of things together. We can see it happening as far away as Uganda." Her film sheds light on the current failures of institutions in Pakistan today and shows how difficult it is to change the status quo within systems already in place. Furthermore, the institutions which continue failing the women of rural Pakistan are sometimes being backed by ideology: "When a woman is hit or something would happen, no one would be sent to jail, no one would be made an example of. The system of violence therefore perpetuates and becomes accessible." Obaid-Chinoy's frustration with the reach of Pakistan's education and justice systems was also clear. "[Women] are not aware of their rights and they don't know what [men] are doing is wrong… women were not aware that they could fight this." Obaid-Chinoy also revealed the difficulties Zakia and Rukhsana faced following the film's release, indicating that the fight for the victims of acid violence is ongoing: "[Rukhsana's husband] has always been a manipulative man, and when the Academy Award came out he decided it was time to make some money off Rukhsana. So, he got her to come home and together they started blackmailing us for large sums of money. He didn't realize who he was blackmailing…"
The discussions in Delhi and Mumbai closed with Obaid-Chinoy reinforcing the film's message and overall aesthetic importance. For the filmmakers, revealing the striking images of women after acid attacks was necessary to "begin the hard conversations to bring about change… This narrative of change must begin, and my generation in India and Pakistan must broaden the conversation to include so many things that we don't talk about." The event followed the Asia Society India-Pakistan Regional Young Leaders Initiative, which brought together 12 promising leaders from India, Pakistan and the United States to a weekend meeting in New Delhi to seek new ways to overcome the challenges facing India-Pakistan relations.